Bubba to the Rescue is book two of the Green Meadow series for young adults, by Jennifer Walker. If you read Bubba Goes National first, you will have an appreciation for the characters, but it is not necessary to read the books in order. Both books are perfect gifts for tweens through young teens. In an age when there is so much emphasis on paranormal activities, goofy behavior, fantasy, and urban lifestyles, it's refreshing to find a book that kids are sure to enjoy which promotes hard work, good ethics, a moral lifestyle, and family relationships. Walker is not afraid to take on difficult topics, but in doses which young readers can process. Bubba is Leslie Clark's Arabian horse (she named him Lucky, but her father calls him Bubba). In book one, she found the horse for sale as a castoff and was able to purchase him, and then ride him to a national championship. Book two begins with Leslie and her boyfriend, Alex, trail riding. They see smoke and discover a forest fire which is threatening a neighbor's ranch. Leslie and Alex save those horses, then ride furiously back to Green Meadow to check on their own ranch. However, during the ride, Bubba is injured. This is the set-up for the rest of the story. It's exciting and believable. It's also the reason for what I think is the only real problem with this book. Bubba, the title horse, and one we've come to love in book one, is mostly sidelined for the rest of this volume. 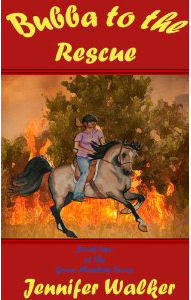 Instead, the book focuses on a horse that followed Leslie and Alex home during the fire. This horse had apparently been abandoned to the woods, and is in need of a lot of care. Leslie falls in love with the new horse, whom they name Spark, and the book is the story of how they find Spark's owner, and whether Leslie will get to keep Spark. Although Bubba was put out to pasture for a while to heal, I wanted Leslie to care enough to go interact with him more often. That said, the book was otherwise excellent. There are a number of serious themes developed (at least to some extent) in this book. Sometimes, I thought perhaps there were too many, but kids have really complex lives these days, so I doubt it will faze most readers. Some of these topics are: injury to a beloved animal, adjusting to a new step-parent, early dating relationships, unhealthy controlling relationships, and father / teen daughter relationships. Although the plot line is the story of Spark, the character development is at least as important as the plot. Many of the chapters are devoted to Leslie's home life with her new step-mother, Helen, or to her friendships. Of course the whole setting of running a stable and caring for the horses is the necessary background for the series. Anyone who loves horses will like this book. It's perfect for ages 10 and up (possibly younger), and adults may enjoy it as a light read. One of Walker's gifts is the natural way she describes all the "horsey" elements. Her personal experience as a horsewoman shows through loud and clear. On a 10 point scale, I give this book a 9. Just one point off for abandoning Bubba (even temporarily) for Spark so early in the series. AND... if you'd like a chance to win an e-copy of the companion short "Leslie and the Lion" just leave a comment for this post. Make sure you do that before midnight EST March 16 (end date of the book tour). One winner will be picked at random. Thanks so much for your great review, Joan! Have to agree with you about poor Bubba. I felt bad for him too. But hopefully we'll see plenty of him in the next book, and we'll see that Leslie was just super busy and I know she hasn't forgotten her favorite first horse! Plus, think of who she ran to when she was upset and she buried her head in his neck... It was Bubba! Great review! Thanks for sharing it with us! I love the Bubba books. This is a well thought-out review and one that is really helpful to readers, especially to grown-ups who are helping their children find books suitable for their age level and reading ability. There's a huge need for this sort of fiction, once described by a literary agent I know, as "a kinder, gentler YA." Maggie, I'd love to know who that agent is! I still love reading horsey books although I don't ride any more. When I can, I like to go with my daughter to the horse she exercises and cares for once a week for a friend. Thanks for the introduction to this series. Emily thoroughly enjoyed both books and is anxiously awaiting the third. How far along is #3? Congrats on the nice review Jennifer. Keep writing your horse stories for kids. When I was a kid there weren't many. Once I finished all that Walter Farley wrote and the Misty series, there weren't anymore. @Kirk: I'm working on it! I'm hoping to have it out this year. 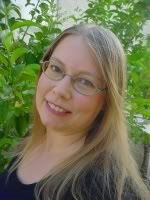 I am the Books editor at Before It's News (beforeitsnews.com). Our site is a rapidly growing people-powered news platform currently serving over 3 million visits a month. We like to call ourselves the "YouTube of news." We would like to republish your content on our site. Our visitors would love to read it, and find out more about you as a blogger, author, and reviewer. You could also publish excerpts of your books (if you have any) if you'd like :). It's a great opportunity to spread the word about your work and reach new readers. We will be featuring and promoting books, excerpts, posts, and reviews on our homepage, on Twitter, Facebook, in our newsletter, and more. Thanks for all the comments, everyone! Winner of Leslie and the Lion is jakill!